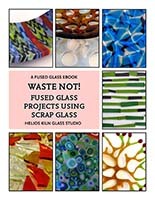 It’s time for another E-Book from Paul Tarlow of Helios Glass in Austin. He’s going to help you use up all of your scrap glass to make super cool projects. Nothing ever goes to waste. I’m trying to decide what I’m going to make first…the mini stack or the pattern bars…maybe both. As with Paul’s other E-Books, he explains things really well with great photography so that glass enthusiasts of all skill levels can successfully take on these projects and figure out how to make them their own. Go get the book, fire up some scrap and let me know what you make. This E-Book is available now.